Windham Presbyterian Church showing horse sheds. The sheds harken back to the days when people traveled to town meeting or church on Sunday by means of a horse. During the time of the meeting or services the horse and their buggies needed a place out of the weather. 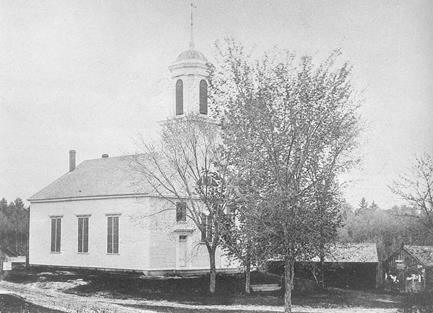 There is an interesting story about Robert Dinsmoor’s arrival at the old meeting house on the hill. You need a little background. “In person, the Rustic Bard was of massive build, broad shouldered, heavy limbed, about five feet ten inches in height, and about two hundred pounds in weight.” His first wife Mary “Polly” Park was his true love, and she died giving birth to their thirteenth child. “With this large family, the eldest but 16 years of age, the demand on him to supply a step-mother was imperative, but the task that would stare a woman in the face would seem appalling…he induced Mary (Davidson) Anderson, then the recently the widow of Samuel Anderson, to assume the trying position of second wife to a leading man in the church, with a wide social acquaintance to be maintained, the cares of a farmer’s life to be provided for, and a family of eleven children…” The marriage was one of mutual respect, but not love. “He uniformly rode to meeting in the ‘one horse shay,’ and as invariably had, “ma’am’ (as he always called Mary, his second wife) with him; she was, like himself, large and portly. He rode up to the west end door of the meeting-house, that being the nearest his pew in the old church, stopped the horse, that was uniformly a good-sized gentle bay, and sat in the chaise for ’ma’am’ to back out, which she uniformly did, as do courtiers in the old world retire from the presence of royalty. Once I remember the good woman caught her foot or dress on the footstep of the chaise and, losing her center of gravity, thereby fell over backwards on the ground. The fall confused her brain and she did not rise immediately; her husband did not dare drop the lines for fear the horse might injure his wife, and he called for aid.” Such were the perils of getting to church by a horse drawn shay. The horse-sheds were removed in the early twentieth century with the advent of the automobile. Of course, the town meeting was a long winded affair, and would have taken place in the town hall. 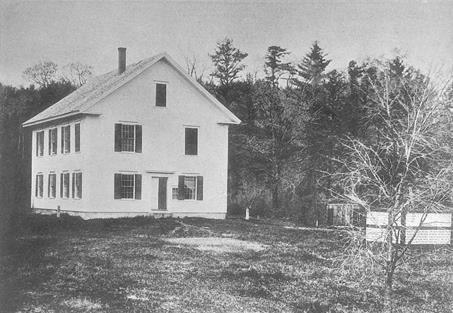 Windham Town Hall about 1880. Town Meeting 1915: W.S. Harris Reporting– There was much interest in the election to-day and a long discussion over the auditors’ report, they having approved the selectman’s report of the financial standing of the town. It seems the Selectmen abated some $1,100 of taxes due from a former tax collector now removed from town, as being in their judgement the best way to settle up the account, but this did not meet the approval of the approval of all voters. The matter was finally laid on the table and the meeting proceeded with the election of officers. First Selectman Samuel F. Campbell declined re-election and William L. Emerson was chosen by a large majority but declined. Third Selectmen Rufus H. Bailey was then advanced to first place, and John E. Cochran and Frederick J. Hughes were chosen as his colleagues…It was voted to raise $1,000 for town expenses, $3,000 for highways and bridges, $2,500 to be used for permanent construction, of which $300 was appropriated for the Range Road near the Hazeltine place. It was voted that a culvert be built near Mrs. Burnham’s residence. The inventory of the town as compared with that a year before indicates that the bottom has dropped out of something, the total valuation standing at $732,389, as compared with over six and a half millions in April of 1913. (I believe this had something to do with the valuation of the property of Edward Searles) The vital statistics show 6 births, 5 marriages and 10 deaths. I have been an avid reader for about 10 years now. I would love to learn more about Seavey pond. Hopefully, I can find some more about William Seavey and Seavy Pond and do a column about it. As you probably know, Seavey lived where the Windham Junction “The Kitchen is today. Thanks for reading the column.